Taif is one of major tourist attractions in Saudi Arabia mainly due to its pleasant weather in summers and beautiful flora in spring season. 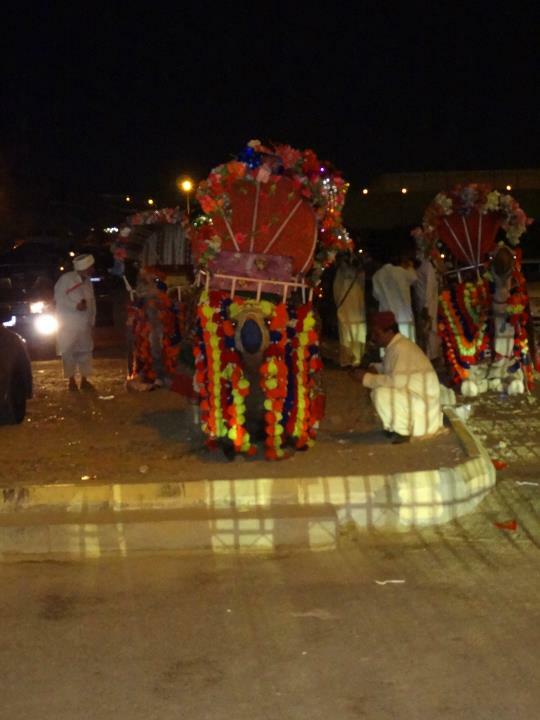 It is said that members of royal family also shift from capital Riyadh to Taif during summers. I would combine my two trips to Taif in this post. It was a hot summer weekend when me and my friends decided to visit Taif. This was my first trip to the place. 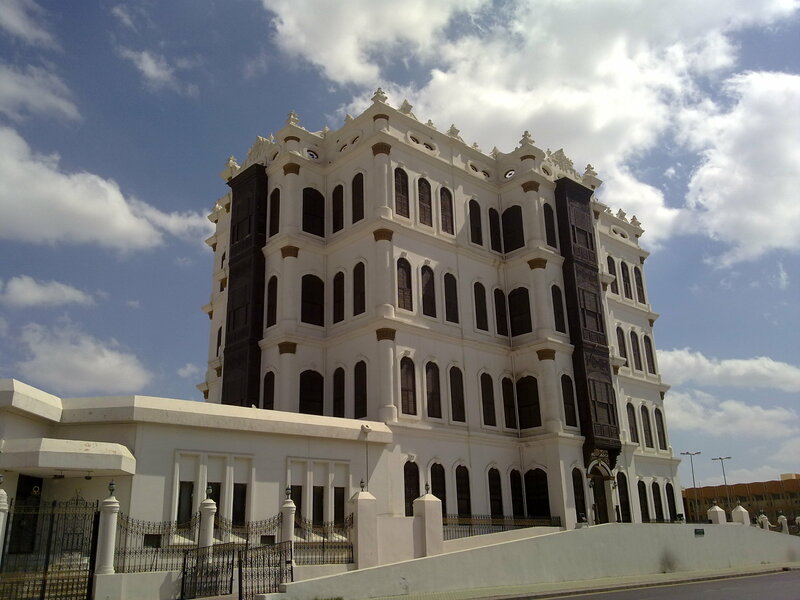 Taif is around 200 km from Jeddah (almost 2.5 hrs drive) and one can easily manage one day trip. It was not a properly planned trip. Just a bunch of guys decided for an excursion, packed in cars and left for Taif. 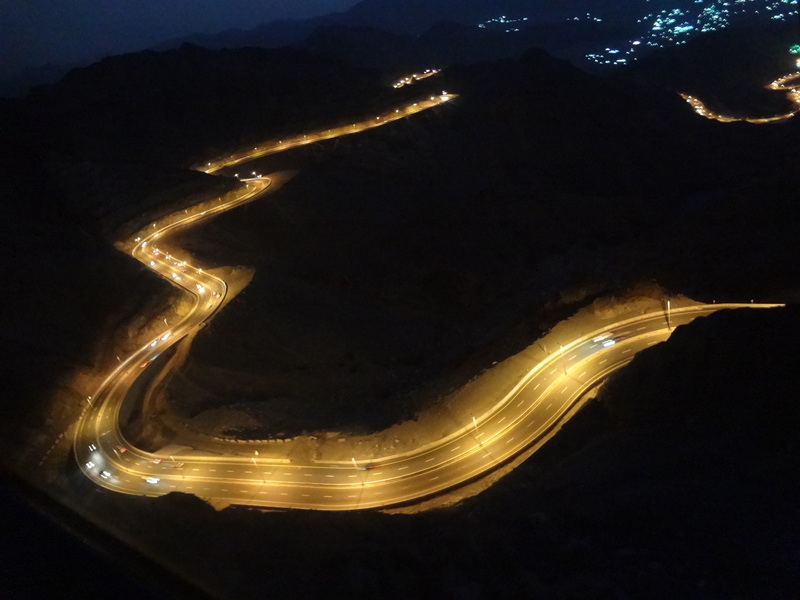 There are two different roads to access Taif from Jeddah. One is through a place called Usfan. Although this road is a bit deserted and longer than the other but its pretty straight, no sharp bends and no steep heights. On the other hand, the second road is through Al-Hada. This road is a bit dangerous because of its curves and sharp inclination. We chose Usfan road. One should be cautious when approaching Taif as there are no safety barriers along the road and camels move freely in the area. I have heard many car and camel accidents in Saudi Arabia. It sounds a bit odd and funny but it’s really life threatening potential hazard specially at night. 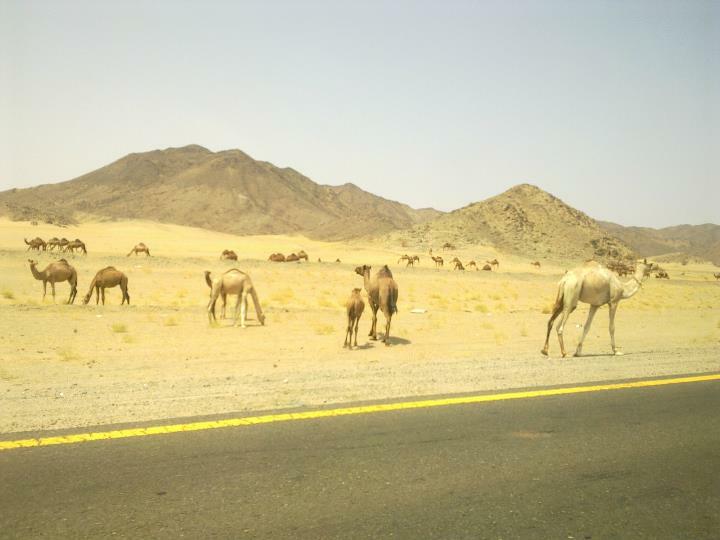 Camels along the road pose a high risk of accident for fast-moving cars as they usually don’t get afraid by vehicles . 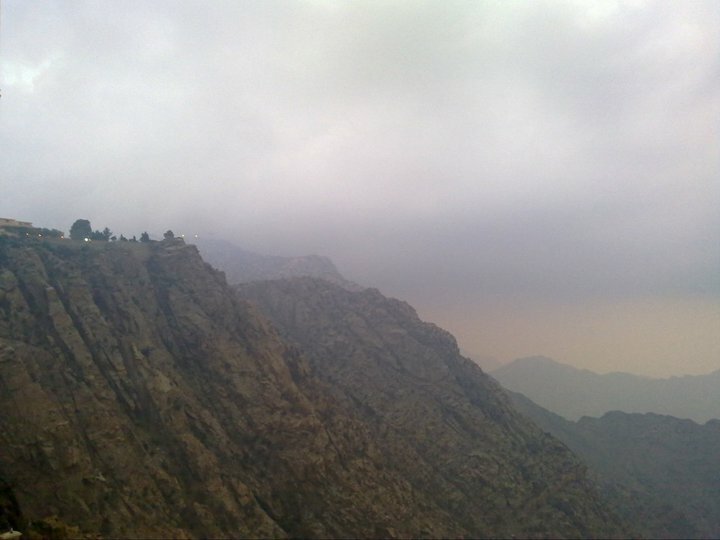 Pic taken near Taif. We reached Taif at noon. Weather was pleasant even in summer. However city was just like any other metropolitan with busy roads, buildings, shops etc. Since this trip was not pre-planned, we all were scratching our heads now and thinking, what to do? Where to go now? None of us knew any picnic spot. We parked our cars along the road and started ringing our other friends back in Jeddah to ask if they know any tourist spot in Taif or its surroundings. 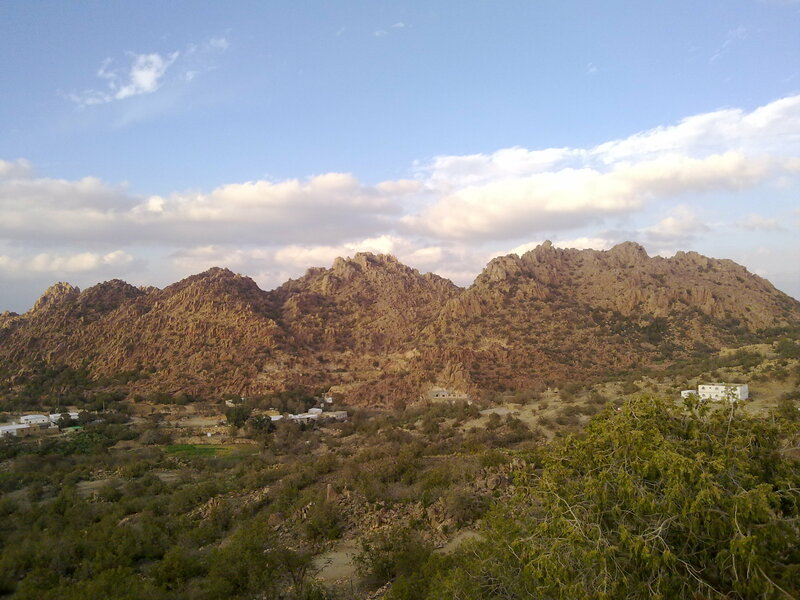 One of our friends told us about a tourist spot – Al Shafa, which was around 40 km further away from Taif city. Thanks to Nokia maps, we had no problem in reaching there. That was really a nice place with beautiful landscape. A view of surroundings while climbing one of mountains. 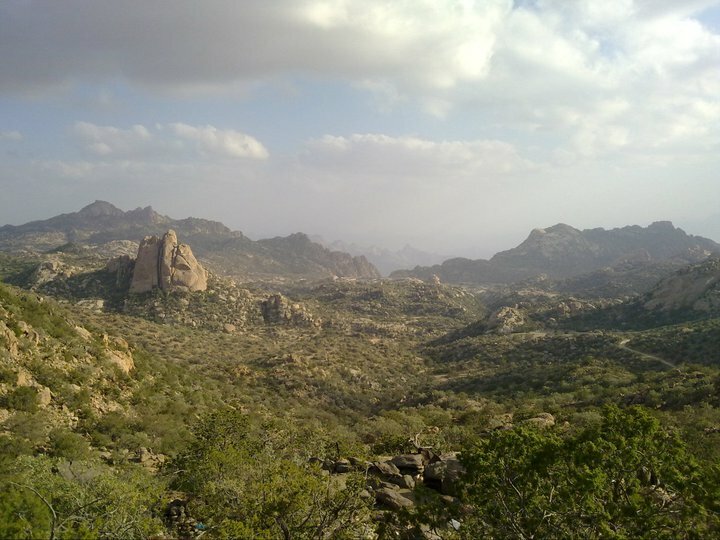 Another view of Al Shafa mountains. After some hiking and exploring the area, we had lunch and then returned back to Jeddah. 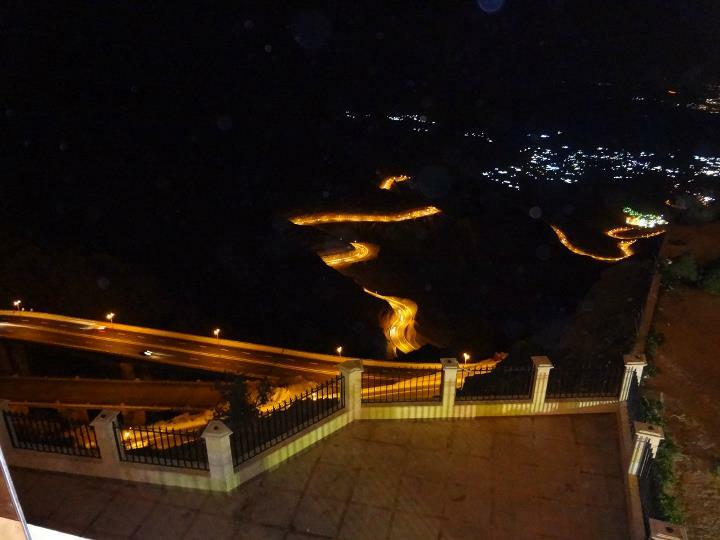 My second trip to Taif was a planned trip as we were going with our families. 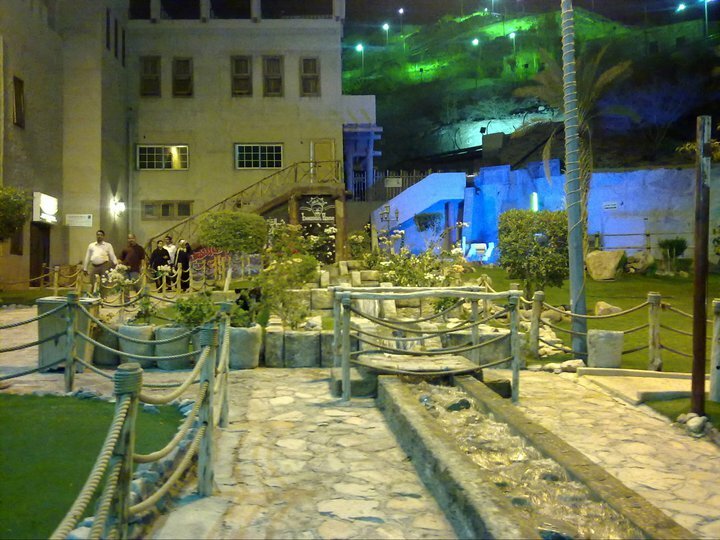 We heard of a family water park in Taif with separate pools for men and women. So on planned date, we headed straight towards Taif water park and spent some quality time taking water rides and swimming in pools. 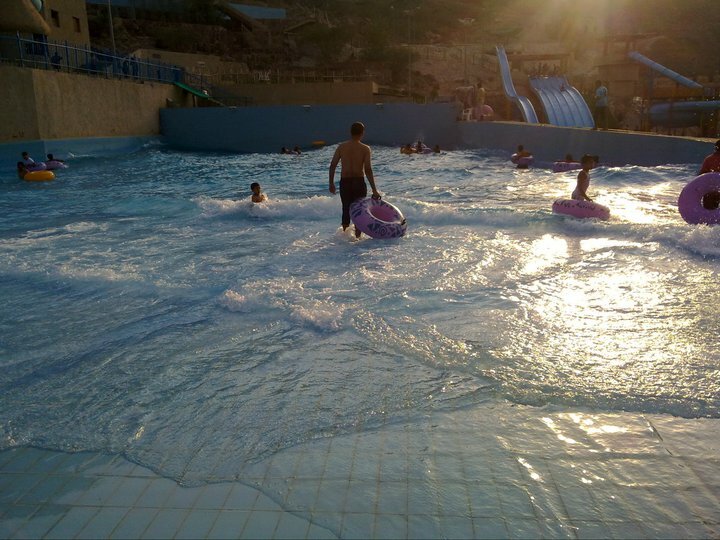 Wave pool in Taif water park. There was a hotel at top of hills. 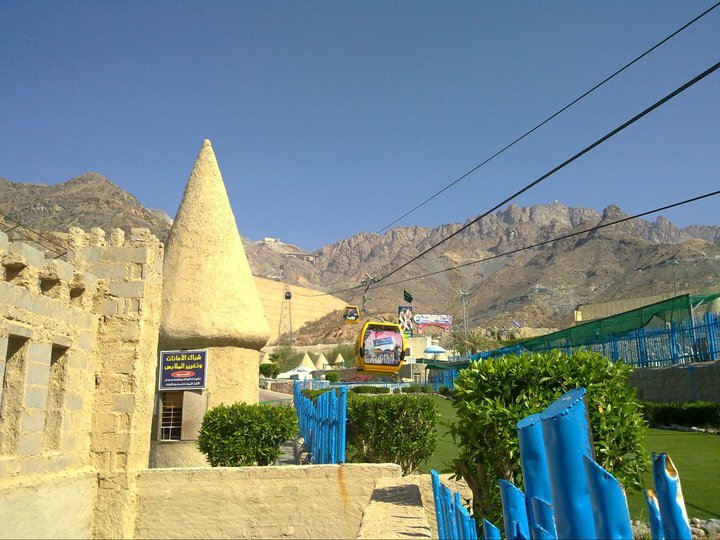 Can you locate small yellow rectangle (Ramada hotel) in below picture on right side of conical structure? 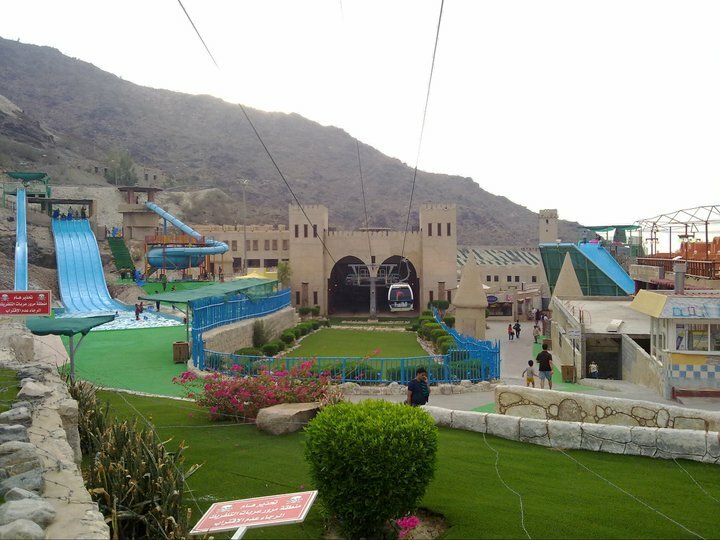 A cable car was operating between Taif water park and Ramada hotel. A view of water park. We went to Ramada hotel via cable car and had a buffet dinner. There was an open balcony giving a bird eye view of the surroundings. We were feeling some cold at balcony due to wind but view was so spectacular that we spent an hour in gossips and enjoying the landscape. A view of hills from hotel’s balcony. Road going down the hill, view from hotel’s balcony. It was getting late now and we still had to drive for two hours to go back to Jeddah. So we left the hotel. While returning back to park, we saw decorated camels but we didn’t have time for a short camel ride. We postponed it for next time. Can you spot camel face in below snapshot? Pic taken from cable car while returning to base. 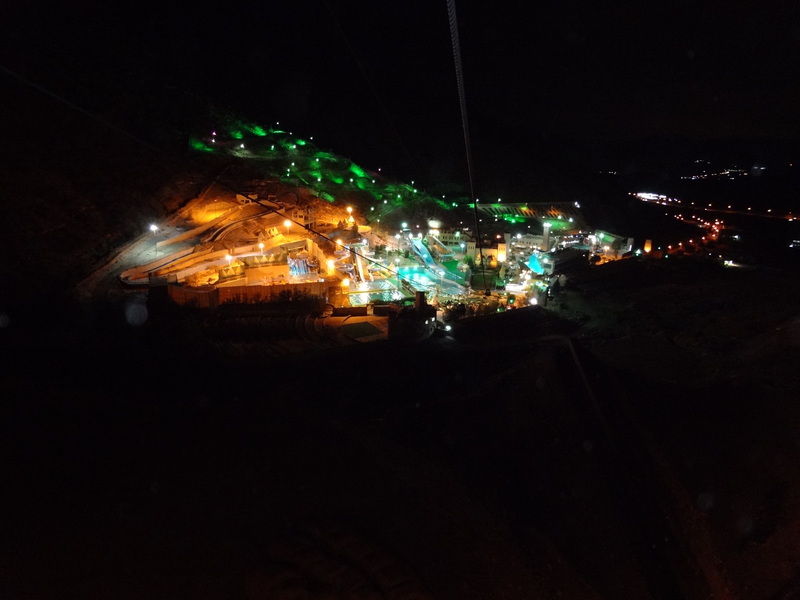 Taif water park at night, pic taken from cable car. Now we were tired. We didn’t waste any time in water park and left for Jeddah straightaway. The day was definitely well spent. PS: The start and finish points of my route are indicative only. Previous PostCave HuntingNext PostWadi Al-Jinn (Genie Valley) Near Madinah – Does It Really Exists?